From the outset, the Local blog imagined itself to be an inclusive reproduction of Fort Greene and Clinton Hill: a mirror image of the populous, varied and vibrant, that would reflect the diverse voices of the community via an open and active public sphere. On the contrary, I argued that the Local blog became a space, like the gentrified blocks of Fort Greene and Clinton Hill, whose primary characteristic was its inclusion of some and exclusion of others. 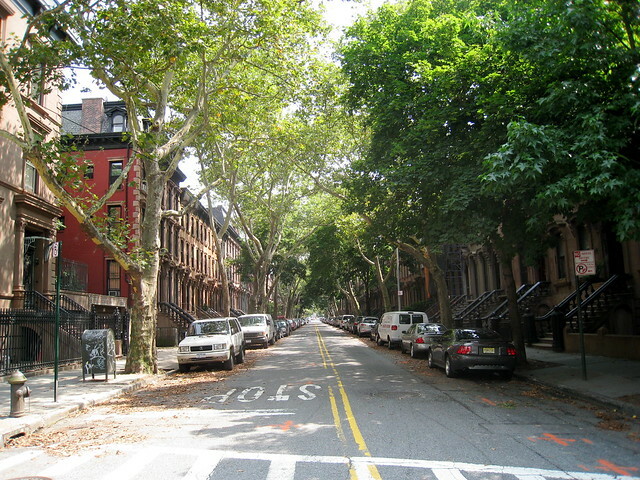 South Portland Street in Brooklyn. Photo by Lana Z Porter. On a New York City subway map, Fort Greene and Clinton Hill, Brooklyn occupy the space between the Fulton and Classon stops along the lime green line of the G train. A sliver of Williamsburg abuts Clinton Hill to the northeast, and below, the intersection by the Atlantic Terminal Mall – a shiny collection of American consumer chains on a once-gritty block in southwest Fort Greene – adjoins the northernmost tip of Park Slope. For a long time, Fort Greene and Clinton Hill, sandwiched between two neighborhoods famed for their “steroidal gentrification,” were the salami and slaw to Williamsburg and Park Slope’s contrasting slices of artisanal baguette. Today, most old-time residents’ biggest fear is that their neighborhood is losing its authentic flavor. “Bistros replace bodegas, cocktail bars morph out of old-style salons, and the neighborhood as a whole creates a different kind of sociability,” writes urban sociologist Sharon Zukin. New eateries characterize the many spatial and social alterations brought about by gentrification. Fort Greene and Clinton Hill, Brooklyn are undergoing these changes at the hands of a neo-upper-middle class that imagines itself to be as gritty and cool as the neighborhood itself. In March of 2009, the New York Times launched a blog by and for the citizens of Fort Greene and Clinton Hill – under the supervision and curatorial authority of the Times – called the Local. The project was twofold: develop a blogging platform for hyperlocal community journalism that could be franchised and sold, and, in the meantime, invest in “retain[ing] a certain core presence and audience in New York … as the paper and the company [became] more and more national and global” (a NYT manager). The New York Times chose Fort Greene and Clinton Hill for the same reasons that the neo-upper-middle class has been moving there in droves: it’s cool, multicultural, quirky and authentic. By appropriating the term “Local” for the blog’s name, the blog’s producers laid bare their intent to depict a particular imagining of the “local.” My thesis focused on what the Local blog could and could not capture vis-à-vis the local in Fort Greene and Clinton Hill. I spent five weeks conducting ethnographic fieldwork on the streets of Fort Greene and Clinton Hill, in the offices of the New York Times, and online during July and August of 2009. The ethnographic examination of a local blog that exists both in the ether and on the ground presented new methodological challenges and necessitated a mixing of methods that I (only half-jokingly) called “ethblography.” Ethblography incorporated traditional, offline ethnographic practice with a new approach to online worlds that not only involved content analysis of the website itself but immersion into and constant upkeep of connections forged online with readers, contributors, followers and antagonists of the blog through different social media such as Twitter, Facebook and other blogs. The medium of the Internet and technological platform of the blog are often touted as tools that might broaden the public sphere. From the outset, the Local blog imagined itself to be an inclusive reproduction of Fort Greene and Clinton Hill: a mirror image of the populous, varied and vibrant, that would reflect the diverse voices of the community via an open and active public sphere. On the contrary, I argued that the Local blog became a space, like the gentrified blocks of Fort Greene and Clinton Hill, whose primary characteristic was its inclusion of some and exclusion of others. One can view gentrification as the privatization of the public spaces of a neighborhood (Jackson, Real Black). The arrival of new residents with the means to pay increasing rents and mortgages created opportunities for new businesses and services to emerge. These establishments altered the physical landscape of Fort Greene and Clinton Hill by creating spaces that certain members of the community would not dare enter for lack of financial means or for the feeling that they were not welcome. Space became a battleground for the physical expression of gentrification. And for the neighborhoods of Fort Greene and Clinton Hill, once celebrated for their lively and colorful public life, gentrification cleansed and colonized the public spaces, making them accessible only to those who had the social, economic and cultural capital to enter. The Local blog too became one of those spaces, in digital form. Furthermore, the producers and scrollers of the Local exalted the blog as an expanded public sphere because of its sporadic inclusion of token “gritty” posts amidst a stream of other content that reflected a largely bourgeois consciousness. Particularly misleading were interviews with locals conducted on the street (the true strollers) who, unlike the scrollers, would not or could not even access the blog or the Internet. Comments on the site lauding the interviews overlooked the unidirectional nature of the interaction. The impression of sociability offered by the blog tricked the readers into believing that they had a real connection to the person or object represented in the text when in fact the relationship was solely symbolic. The scrollers believed themselves to be strollers. The satisfaction of feeling connected to members of the community whom one would rarely encounter in real life was what made the Local popular yet problematic. The blog was a fantasy world for the scrollers. The Local expressed the hopes and dreams of the particular subset of society that had the means to access it. The readers of and contributors to the Local were complicit in this project of imagination because the blog affirmed their way of life, absolved their presence in the neighborhood, and applauded a faux-inclusivity of neighbors who were in fact quite excluded from and marginal to the spaces the neo-upper-middle class’s arrival had helped to privatize. Rather than bringing the old and new sociabilities of Fort Greene and Clinton Hill together, the Local blog, I concluded, drew them apart. This article is drawn from my senior thesis on hyperlocal media and neighborhoods at University of Pennsylvania, from where I graduated in May 2010 with a B.A. in Cultural Anthropology and minors in Science, Technology and Society and Theatre Arts. This is Part I of a series about the thesis that will include reflections on methodology, materials from the research process such as interviews and audio clips, follow-up analysis, and suggestions and thoughts on potential applications and further research. The Brooklyn “Local” blog is still active after a changeover of leadership from the New York Times, which remains involved as a quiet partner, to the CUNY Graduate School of Journalism. The above analysis applies only to the blog during the time of my fieldwork and does not necessarily reflect the current Local. For a copy of the thesis in its entirety, or for any other correspondence, please e-mail lanazporter@gmail.com. Special thanks to my thesis advisor Dr. John L. Jackson, Jr. at the University of Pennsylvania’s Annenberg School for Communication and the University of Pennsylvania Benjamin Franklin Scholars program. Thank you for your interesting post and congratulations on finishing the thesis. In the neighborhood I lived in in Washington, D.C. I saw how the local leaders and elected officials were not online became aware of the growing blogosphere, and attended community meetings where articles from blogs were printed off and passed around among public housing residents. Another friend of mine, a retired school teacher, published a small newsletter that would re-print items from the web for the residents of her building, for elderly people on fixed incomes. While I don’t mean to suggest this was necessarily happening in the case you are discussing (In large part because the blog may not be focusing on the issues of interest to everyone in the community), it suggests some of the unexpected patterns of information sharing. In a world where local blogs are a reality, a nuanced understanding of the role they can play is necessary to promote constructive online interventions. An interesting look at The Local. If you’ve continued to follow it, you’ll know that the staff is now largely made up of journalism students who don’t live in the neighborhood at all. And from the start, the site was never run totally “by and for locals.” The original editor was a Park Slope resident, and there was no secret about it. The real shame about what happened was that the Times chose what was already deemed the “bloggiest neighborhood” in Brooklyn due to the number of independent and different voices already documenting the streets there – from Brownstoner to Clinton Hill Blog to Myrtle Shuffle to Clinton Hill Chill (the last of which was wonderfully written by a “pre-gentrification” resident) – and rode in on the coattails of an already interesting and vibrant blogosphere. Obviously your post here is just a section of your research analysis, but I’m keen to know if you discovered any of the “real” local blogs during your “ethblography.” If you didn’t, then you missed a big piece of the puzzle. Did you live in the neighborhood during that time? And how did that affect your research? As someone who has done my own graduate ethnographic research on blogging and virtual communities, I’ve found that no one “local” blog can really be a true representation of an entire neighborhood, though their anonymous commenting feature does allow issues of class, race and gentrification to play out in a way that it never would in person. The true problem with the Local is that without living and breathing a neighborhood, you can never really capture its spirit. Which is what hyperlocal blogs are all about (IMHO, anyway). Its very interesting that the leadership of the Local has changed from the NYT, which is now a “quiet partner” to the CUNY School of Journalism. Have you looked at it since the change-over? If so, what are your thoughts on how the blog is different now? Rob, I suspect that some items from the blog were indeed circulated at community meetings and forums. I did not study this phenomenon directly, but my hunch is that many of the people whose attention was directed to the Local in that way did return to the site, particularly to make comments. There were folks who commented again and again on hot-topic posts and tended to represent the voice of the old-timers; they may have been part of that contingent. It would make an interesting follow-up study to try to find out who these people were and what role the Local played for them, particularly with respect to the political life of the neighborhood. CHRez, certainly a blog can never really capture the essence of a whole neighborhood. When I first started studying the Local, I was struck by how many other blogs already covered the neighborhoods of Fort Green and Clinton Hill, and how resistant some of the bloggers were to the Local’s arrival. While the other blogs did not play a large role in my thesis (which ended up focusing on the hegemonic nature of having a local blog tied to an institution as powerful as the New York Times), I was very much aware of the tension between the Local and the perhaps more organic, more “local” local blogs. And I completely agree: for a blog to be local, its writers should make their best effort to live and breathe the neighborhood. Unfortunately, I did not live in the neighborhood during the time of my research, though I did commute nearly every day from Manhattan (where I had a rent-free place to stay). Perhaps the thesis would have been more ethnographically rich if I had had the opportunity to live in the neighborhood. Dayna, I’ll admit that I haven’t followed the Local closely since I graduated last May. From my sporadic perusals in the past few months, I will say that I am still concerned by the insertion of token “gritty” posts. Rather than presenting a montage of stories that represent the diversity of the neighborhood, it seems that the Local continues to appeal primarily to the scrollers.